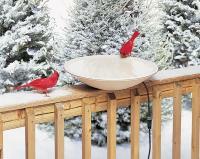 Does your bird bath turn into a skating rink when the temperature drops? If so, a heated bird bath may be what you need. 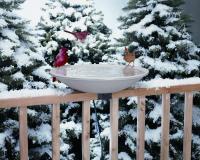 A heated bird bath will stay balmy regardless of the weather, providing a much-welcome retreat for your feathered friends. Whether you reside in Alabama or Alaska, birds will flock to the temperate waters of a heated bird bath, providing your backyard with a healthy dose of natural beauty. 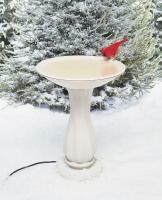 Most products in our selection of heated bird baths are ready to be shipped immediately. And like all our products, our heated bird baths are backed by a 30-day money-back guarantee, so you can be confident you’ll find the product that best fits your needs. 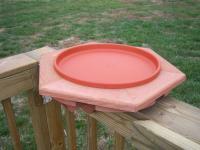 Great item - the birds went to it within one day of setup - setup is easy for someone who is handy and has a power screwdriver - took only 5 minutes, and the anchors are a must to keep the birdbath from tipping over in the wind. We received this bird bath as a gift three years ago and it's been going strong ever since. Some features we like: 1. Following the instructions was easy and when filled with sand, has great stability! 2. Easy to clean with a brush. 3. Doesn't over-heat and kill the heating element when it runs dry and we don't notice. 4. Squirrels and birds love it alike! This bath is used daily. 5. In -16F weather (-9C), water is not freezing and animals love it. Some features are poor: 1. Attachment of the bath to the base is loose and cannot be tightened more. This does not cause problems, however, it's a weak point in the design. 2. The plastic surface of the bath can be slippery for birds. They prefer our concrete baths over this bath during warm weather. 3. Would like this to look more like concrete and less like plastic to blend in with our yard. Overall -- this birdbath has performed well and lasted several years. We give this an excellent rating and recommend this for someone looking for a birdbath + heater combo that can be used year-round. 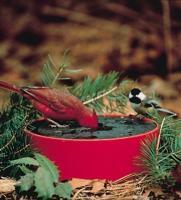 For me, it would be much better if the drinking hole for birds were the same size or larger as for wildlife. Difficult to remove lid and clean. Therefore, I plan to use without the lid except when very cold. We purchased this bath for our pet Muscovy Duck. It has been a pleasure not fighting ice this winter, it does not even freeze on the edges. It was a great investment! I am giving this item 4 stars because when I bought it I did not know I was going to need an expensive extension cord before it could be used. 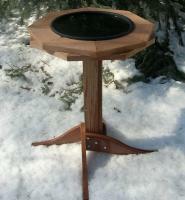 However, overall it is a good heated birdbath, and is working well here in New York in January. It does not make the water warm/hot it just keeps it from freezing. The water is cold to the touch. 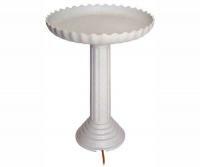 The birdbath is light and can tip over easily unless it is weighted down inside which is not a problem. I used a few rocks as I did not have any sand. My birds have not used it as yet because I have a Red-tailed Hawk around my yard which is keeping the birds away. I am sure when the danger passes the birdbath will be used. 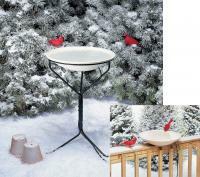 I would recommend this item to anyone who want to take care of our feathered friend during the winter months.